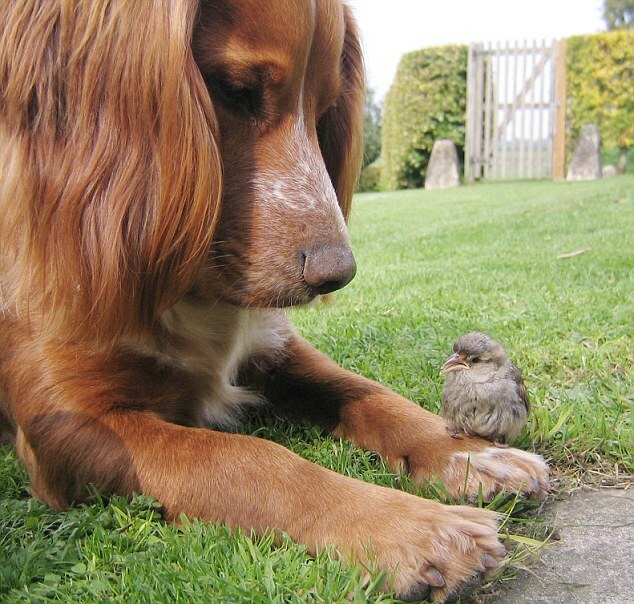 They were originally bred as hunting dogs who would think nothing of gobbling up a tiny bird as a tasty snack. 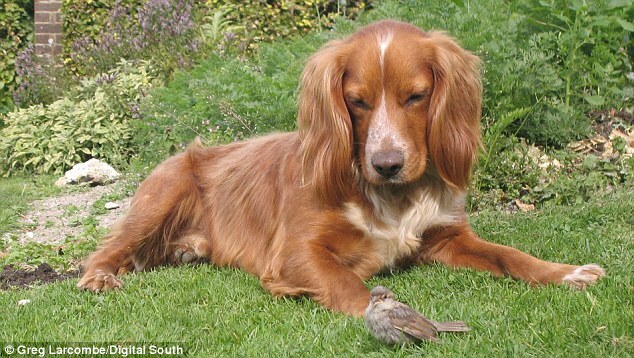 But cocker spaniel Flint went against all his natural instincts to befriend this tiny sparrow which had tumbled out of its nest and crash-landed in the garden. Chicky appearing in great danger and he tumbled on to the lawn in Wiltshire, but softy Flint appeared to have taken pity on him. The dog's owner Greg Larcombe and his four children noticed the unlikely friendship blossoming in their garden and were thrilled that they had a new pet to look after - if only for a short time. Twins Rebecca and Annabel aged 13, Harry aged 11 and eight-year-old Sophie fed Chicky a diet of mealworms - and soon he was strong enough to fly away. Flint's ancestors came from Spain and were bred in the UK to specifically catch Eurasian Woodcocks, which is where the term 'cocker' comes from.